How Are Die-Cut Flyers Different From Regular Flyers? 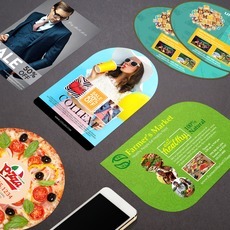 Since most flyers are cut into rectangles, the term “die-cut flyer” commonly refers to a flyer that is machine-cut into a non-rectangular shape. Die-cut flyers are cut with machines that use special blades (called dies) customized to a desired shape. A die-cutting machine allows large quantities of flyers to be precisely cut into any two-dimensional shape. With custom dies, a flyer maker can create shapes more interesting than typical rectangles. Some popular die-cut flyer shapes include circles, ovals, half-circles, and leaf shapes. Why Do Die-cut Flyers Cost More? Most flyers are rectangular because rectangular shapes only require a regular straight cutter. Creating a custom die for a special shape is a more involved process that can have a higher initial cost per flyer compared to regular flyers. However, this difference in cost is greatly reduced when printing large quantities, as you only need to create the die once. If the printer service already has the die in the shape and size you need, the cost of creating die-cut flyers is brought down even further, quite close to that of regular flyers. 1.) Die-cut flyers make you look twice. Your next sale may very well depend on your flyer being noticed. Given that most flyers are rectangular, a die-cut flyer will certainly stand out, especially when it’s next to other flyers. A flyer with an interesting shape will amplify any message and give a touch of the extraordinary to your promotions. 2.) They’re seen as more “high-end”. High-end businesses distinguish themselves from the rest by avoiding the ordinary. In the same way, die-cut flyers can enhance the premium look and feel of any brand by instantly setting your materials apart from everyone else’s. If you need to add a bit of sophistication to your flyers, custom shapes should be your first option. 3.) You’re not restricted to rectangles. If your business branding relies on specific shapes, die-cutting will give you the ability to create flyers with shapes that complement it. Businesses that want to project a creative or unconventional image will also appreciate the way die-cut flyers can highlight those qualities. Get started with die-cut flyer printing today.